"Van Halen will release its first-ever live album to feature original singer David Lee Roth. Recorded on June 21, 2013 at the famed Tokyo Dome in Tokyo, Japan, TOKYO DOME LIVE IN CONCERT includes 23 songs, spanning all seven of the band’s albums with Roth. It will be released as a double CD; four-LP set on 180-gram vinyl; and digitally beginning March 31, 2015. 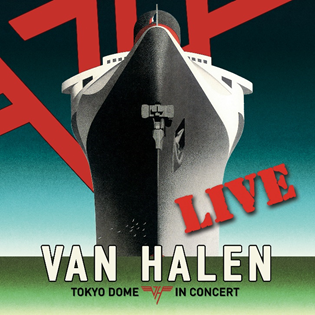 Fans who pre-order Tokyo Dome Live In Concert before its March 31 release date through Amazon and digitally at iTunes will instantly receive downloads of “Panama” and “Runnin’ With The Devil.” Go to http://van-halen.com/ for updates and more information. Van Halen reinvented the sound of hard rock in 1978 with its influential and wildly successful eponymous debut album and then achieved even greater success six years later with 1984. Both albums would define a generation while selling more than 10 million copies each in the U.S. alone to earn diamond-certification from the RIAA. The band recently went back to the original analog tapes and remastered both of these landmark albums – Van Halen and 1984 – which are now also set for release on March 31, 2015 through Warner Bros. Records with pre-orders through Amazon available now. Mastering engineer Chris Bellman, who remastered the original albums for Bernie Grundman Studios, Hollywood, CA, was enlisted for these new versions. In order to produce the original sound the band intended, Bellman cut straight from the quarter-inch tapes for CD; for 180-gram vinyl; and for the digital version. Newly mastered versions of Diver Down, Women and Children First, Van Halen II and Fair Warning are also being cut for each format and will be available soon. TOKYO DOME LIVE IN CONCERT features an electrifying performance by singer David Lee Roth, guitarist Eddie Van Halen, drummer Alex Van Halen, and bassist Wolfgang Van Halen. Mixed by award-winning engineer and mixer Bob Clearmountain (Rolling Stones, Bruce Springsteen, Roxy Music, Nine Inch Nails, and many more), and mastered by Chris Bellman, the album features such classic anthems as “Dance The Night Away,” “Beautiful Girls,” “And The Cradle Will Rock…” “Unchained,” and “Everybody Wants Some! !” as well as blistering versions of “Tattoo,” “She’s The Woman,” and “China Town” from the group’s most recent studio album, A Different Kind of Truth. A deluxe collection featuring Tokyo Dome Live In Concert and the newly remastered Van Halen and 1984 albums, as both a four-CD set and a six-LP vinyl set in special packaging, will also be available.